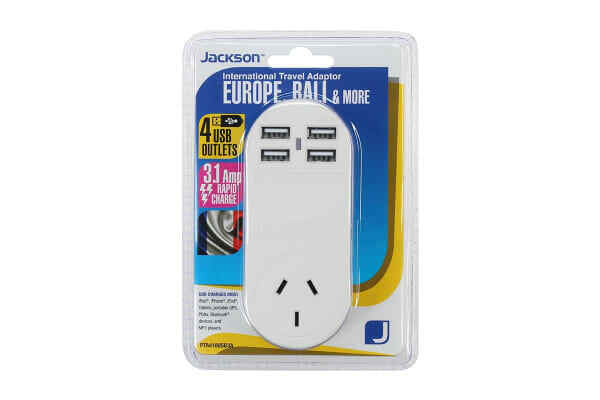 The Jackson 1 Outlet Travel Adapter with 4 x USB Charging port (EU) is a handy pocketsize outbound travel adapter that allows you to fast charge up to 4 USB driven devices simultaneously and also features a power outlet for an additional appliance. Keep all your much needed devices fully charged including most iPhones, iPods and iPads, as well as other MP3 players, Portable GPS, Bluetooth devices and much more. Please Note: This adapter does not convert voltage. Please check the supply voltage and voltage required by your appliance.